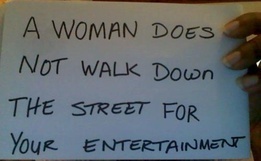 Do You Respond to Street Harassment? Remember that time you were walking down the street and someone called out, “Can I get some fries with that shake! ?” Yeah, that’sstreet harassment. We want to know how people respond to street harassment and have created some questions that will help us learn more about it. Click here to take the survey. We appreciate your help!